As a new or learner driver, it is essential you know your speed limits so we've put together the information you need to learn and recognise different speed limit rules. Back in March 2017, the fines and penalties attached to speeding were made tougher; and 'not realising it was a 40mph zone' is not a good enough excuse! The Department for Transport issued guidance related to speed limits, which defines a built-up area (restricted road) as one which has “a system of street lighting furnished by means of lamps placed not more than 200 yards apart”. 'Built up areas' always have a MAXIMUM speed limit of 30mph. These areas are also likely to have additional, well-signed rules in place for peak-pedestrian times, for example, 20mph limits enforced around school commute times. 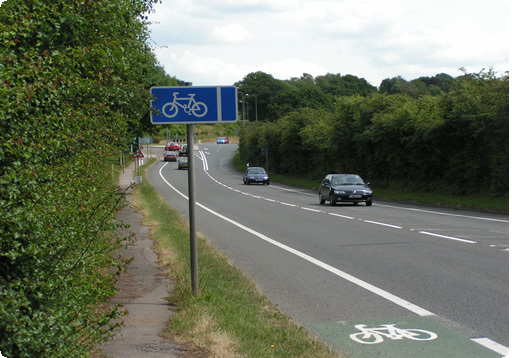 What is a 'single carriageway'? A single carriageway is a road in which the traffic flowing in both directions is undivided. Many people get a single carriageway confused, thinking if there is more than one lane for traffic in one direction, it becomes a dual carriageway - this is not true. The term 'carriageway' refers to the whole road (traffic in both directions). 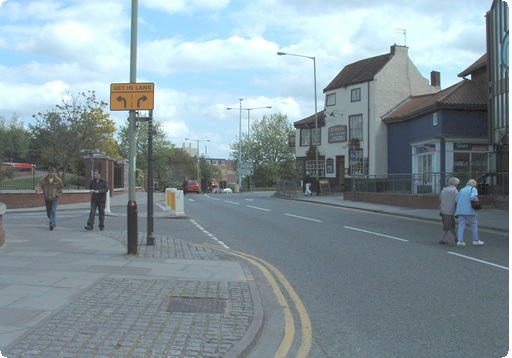 A single carriageway also does NOT have traffic lights placed less than 200 yards apart. The speed limit on a single carriageway is 'national speed limit' which is 60mph for a car, and 50mph for a car towing a trailer. You will often find slower-moving road users on single carriageways so always be aware of cyclists, tractors or equine. While the maximum speed limit on a single carriageway is 60mph you must always use your own common sense; do not approach bends or dips in the road at 60mph, and you're likely to need to drive much slower in adverse weather conditions. A dual carriageway is a road with separated traffic lanes for each direction. The division is referred to as a central reservation; often in the form of a metal barrier. 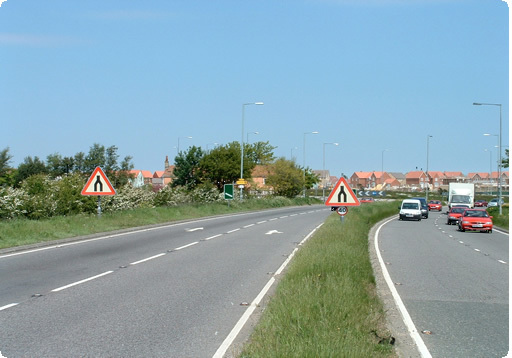 Dual carriageways have the highest speed limit of any UK road; 'national speed limit' which is 70mph for cars, and 60mph for a car towing a trailer. While the national speed limit is the maximum speed you can travel on a dual carriageway, many of them will have a different speed limit which is well signed. The reason for which may include a turn or concealed entrance; if there is another speed limit present it will be well signed. 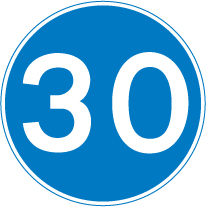 NOTE: Some learners often get confused with the term ‘national speed limit’ as it is different for different road types. Simply put, it is 60 mph for a single carriageway and only 70 mph if there is a central reservation separating the two carriageways. 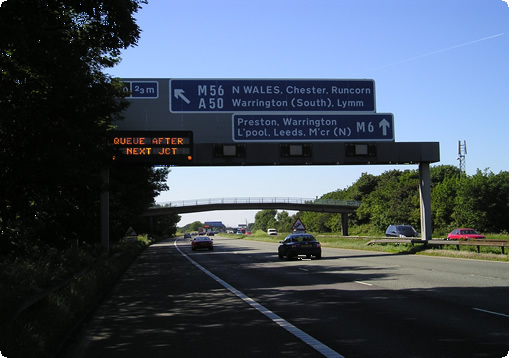 A motorway is a major road which has been specially designed for fast moving travel. Statistically, motorways are the safest roads in the UK due to everyone travelling at similar speeds in the same direction. These are usually found to have three or four lanes travelling in the same direction on both sides with a central reservation separating them both. Typically, the speed limit for cars on a motorway is 70mph. However, this varies from vehicle to vehicle and if your on a 'smart motorway' or not. A smart motorway uses technology to actively manage the traffic flow by changing speed limits and opening or closing lanes at busy times. To use these correctly, you must pay attention to the overhead digital signs and follow the current instruction. 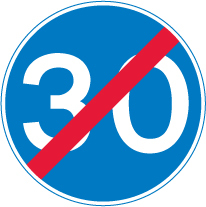 For example, if the overhead sign is saying the speed limit is 50 mph, you must abide by that as the national speed limit is no longer applicable. 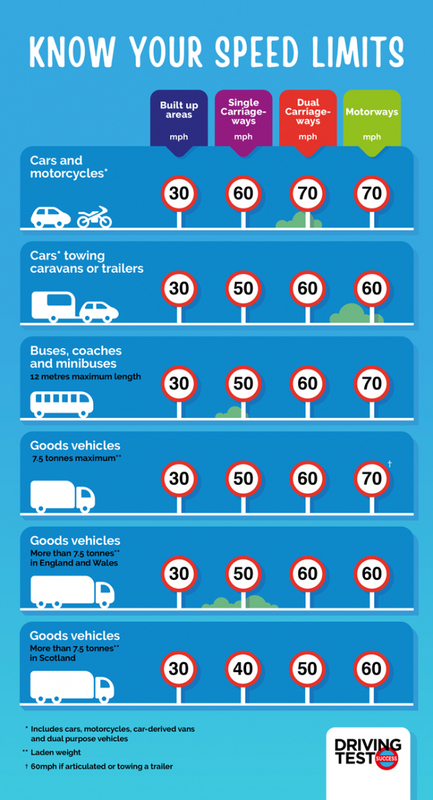 Take a look at the graphic above and note how the speed limit differs for different vehicle categories. While a car can do 70mph on a motorway; a lorry can only do 60mph. Be mindful of this and overtake safely if you need to. Speed limits are enforced for a number of reasons, which relate not only to the lack of control you have over a vehicle travelling too quickly; but the absolute impossibility to stop in time if you're travelling way above the speed limit in place. For example, if you were travelling at 30mph in a built-up area, it would take you 23 meters to stop. However, if you were travelling at 40mph in a built-up area, it would take 36 meters to stop. Those extra meters are the difference between stopping safely and being involved in a collision. Click here to find out more about stopping distances. If you are caught travelling over the speed limit for the road, the penalties range from 3 points on your license to disqualification! Read more about speeding penalities here. Is there such thing as a minimum speed limit?